According to my guys, it's been far too long since there's been some sweet treats in the kitchen. Sure, there was Blueberry Sour Cream Coffee Cake, and Black Bottom Banana Bars, but in their eyes, that was ages ago! So after hearing their pleas, I checked my pantry inventory to see what was on hand. Noticing I've still got a large quantity of quick cooking oats in the cupboard, I went searching the Taste of Home site to see what I could use them in. I found these Strawberry Oatmeal Bars, and actually had everything I needed to make them. Be sure to use good quality preserves, and if you don't like strawberry, you can definitely change it up to any flavor you like. If you're not a fan of coconut, you could use toasted walnuts. I love how easily this comes together, and I'm hoping to make them again with some homemade blueberry or blackberry jelly from our own bushes later this summer. Thank you so much to Flo B. for sharing the recipe! Happy #NationalPicnicDay! Fingers crossed, it looks like New England may have finally turned the corner into spring. There's nothing we love doing on a nice day more than packing a lunch, hopping in the car, and finding a spot for a picnic. Standard fare in the past has been PB&J sandwiches, chips, cookies, maybe some fruit. I've been trying to expand the variety of food I've been eating, and incorporate more vegetables into my diet, so when I saw this Marinated Three Bean Salad, I knew I had to give it a try. I only made a few small changes. I used low sodium black beans, and I had heirloom mini tomatoes on hand. I rarely have fresh herbs, but made a point to go out and buy as many as I could find for this. I loved all the colors and textures. It gets better as it sits, and though it suggests four hours, I thought it was even better the next day. A little while back, my Taste of Home Special Delivery Spring box arrived, and in addition to all the great kitchen gadgets and food items was the Healthy Cooking Cookbook. I sat down and started marking recipes to try, and today I'm sharing my review of the Fruited Mixed Greens Salad. The weather has been all over the place here in New England. We had a beautiful stretch of spring-like conditions, and I seized the opportunity to make this beautiful salad. It's packed with greens, fruit, nuts, and veggies. This was my first time ever eating beets, can you believe it? I've had them on the to-try list for years, but just kept putting it off. Loved them, and I will love them even more fresh from the farm rather than canned. Oh, how I've been looking forward to #NationalGrilledCheeseDay! Back in October, I changed my eating habits, and bread was one of the things I've cut back on. I do allow myself splurges, like pizza every once in a while, and then there was this grilled cheese. I love that it's loaded with veggies, and the cheese melted so perfectly. But the bread made the whole sandwich. Rye and pumpernickel marbled together, griddled to the perfect golden brown deliciousness. I admire photographers who can get "THAT" shot, where the cheese is melted and oozing. I am not that photographer. Grilled cheese is one of the few things that I don't want to fuss over, or reheat it to eat it, so I take a dozen or so quick pictures, devour the sandwich, and hope I got a good shot. A little while back, I issued myself a challenge to clear out my pantry and freezer. I've done a good job with it, but I still was looking to reduce it more. My guys are infamous for not finishing a bunch of bananas, and the result of that is bags that contain 2 or 3 peeled bananas piling up in the freezer. My go-to is normally banana bread, but I'd printed this recipe a while back, and thought I would give it a try. I made no changes at all to the recipe. I was distracted while dividing the batter, so my layers came out a little closer to even. Doesn't matter. They're delicious. They're not super sweet, and they've got fruit, so they're great for breakfast as well as dessert! I made a single pan, but the next time I make them, I will double it, because they went fast. Thank you so much to Rene W for sharing the recipe! My son and I really enjoy pulling April Fools pranks on each other. He's getting older and harder to pull one over on now, but I didn't want to give up the tradition. They almost always have something to do with food, and this year's idea was something I saw on Pinterest. 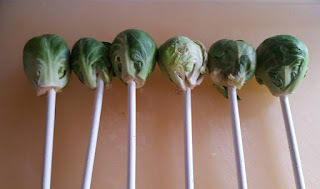 I placed a half dozen brussels sprouts on lollipop sticks. I melted 1 cup of semi sweet chocolate chips with a teaspoon of vegetable oil. I coated the brussels with the chocolate, and then I rolled them in some holiday sprinkles. I laid them on some parchment and put them in the fridge to set up. I almost didn't get pics, because I assumed he'd put one on a plate and sit to eat it. Nope. He just grabbed one and took a huge bite.